OK wow, yes it's been .... um ... about 2 weeks since I posted anything. But not without good reason! We had a very nice Christmas day here at our house with my family & my mom was here for a couple days. Then we had one set of grandparents visit us (Brian's father) for New Years Eve for Round 2 of Christmas. Then... the 2nd set of grandparents (Brian's mother) visited us this past weekend for Round 3 of Christmas. We ate lots of good food, opened tons of presents and had a wonderful time. 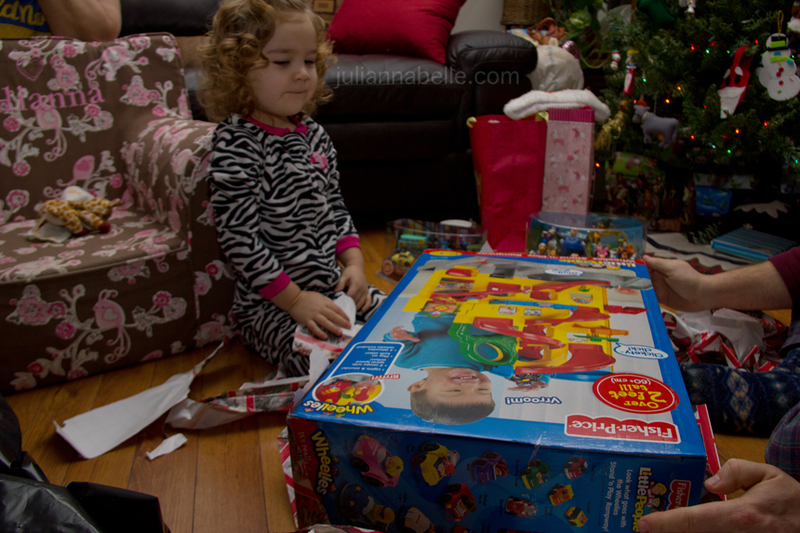 Julianna had a blast opening all her presents from everyone. She is only lucky girl!! We are all Christmas'd out & I'm so ready to put the tree away for the year. I love Christmas but I am so ready to have my house back to normal. One thing that was kind of a bummer was; Julianna had her first swim lesson scheduled for this past Saturday. Brian took her to the YMCA, they got changed, showered, and walked out to the swim area... but then they were told the swim lesson was canceled! Something happened in the previous class, and someone got hurt. The ambulance was on the way and they canceled the class that Julianna was in. Julianna was so upset and was crying that she didn't want to take off her bathing suit... Poor kid. We talked it up all morning and she was so excited, only to get let down once she was there. The lessons resume in 2 weekends for 10 weeks straight... I am looking forward to her going again. 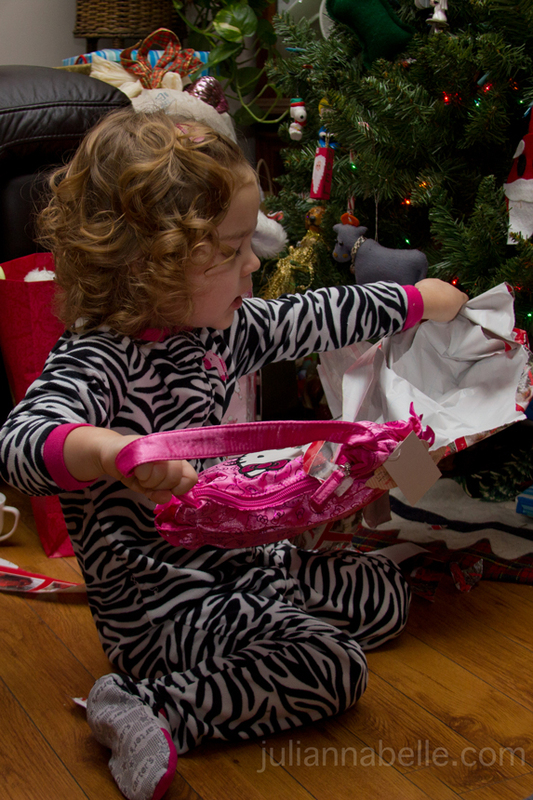 As she was opening every present, she would say "I know what it is" before she even saw it - HAHAHA! 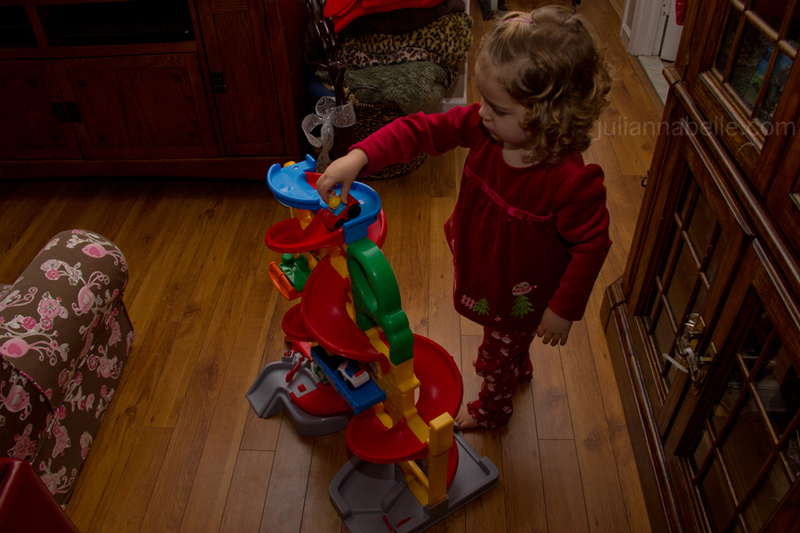 This was by far her favorite gift from Santa... a wheelie car garage! She loves this thing! Squirrel puzzle. She loves it! Julianna with her wheelie garage! She loves coloring with her new markers on her Toy Story coloring pages! 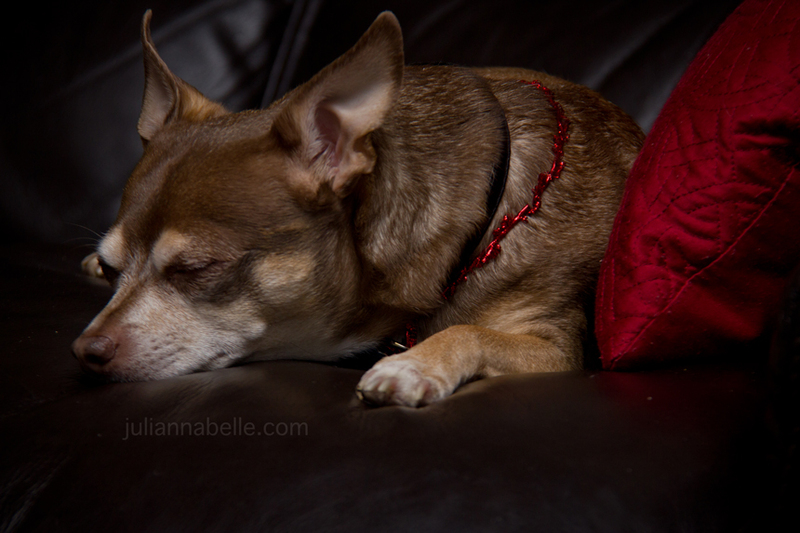 My mom's (somewhat robust) Chihuahua taking a much needed siesta on Christmas morning. I hope everyone's holiday was fabulous! I love her pajamas. They are so cute. She is growing up so fast. So pretty - I still love the curls. you had a great Christmas!!! Julianna is growing so fast!! she is still a beautiful little girl!!! love her curls!!! Hope things are going fine with you and Brian.. Miss our Christmas Eve's together. We had 17 here for Christmas then of course Bec's birthday , Nicole's birthday, which is the same day as Bec's, then my niece had her's on the 29th . we opened gifts on the 28th then we had Morgan and Emily New Year's eve which we watched the ball drop with a toast of Sprite in wine glasses! Emily got a kick out of that!! Please take care of yourself and let us know when the next one comes! !Love to all!!!!! Mrs. G.
I know- I always think of you guys on Christmas eve!! We did it for so many years! It's just not the same! Julianna is so pretty! I just love her curls. I know I probably say that alot. It's true! Sounds like y'all had a very busy Christmas. I love the picture of her hugging her dad. So sweet. You can display it someday at her wedding...probably too early to think about that. lol. I know what you mean about getting everything packed up! I'm actually taking a day off of work on Friday so I can get my house back in order! I can't beleve how big Julianna is getting! It's really cold and I miss skiing. 21 weeks - more than halfway there!